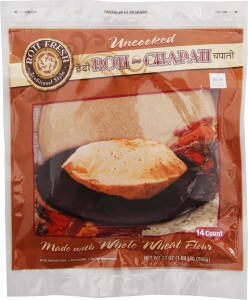 Roti Fresh takes great pride in bringing you a premium uncooked roti that cooks fresh in just seconds. This round flat bread is typically made of finely milled whole wheat grains. The roti is considered a primary food that is enjoyed daily in India and in many other parts of the world. We have eliminated the hassles of preparation and locked in the freshness to allow you the customer to savor that home-style delicious taste and freshness. No more hassles, simply heat up your tava, watch your roti puff up, and ENJOY! Place roti on tava for 20-30 seconds. Turn roti over and heat for an additional 20-30 seconds.